Your School Not for You? You seek a better academic fit. You seek a better fit socially. You seek a better fit geographically/environmentally. You seek a better fit financially. Ready to start your College Transfer Application? The transition from high school to college is thrilling, scary, and typically not what you expected. No more curfews, parental hovering or rigid school rules. You’ve entered a land where your class time per day is quartered and your workload is doubled, at least. There are all-day dining halls resplendent with buffets of food and you can go weeks without needing to speak to anyone. This newfound freedom can lead to profound unhappiness and a sense of displacement for many of the students we have worked with over the years. After the initial excitement of “Wow! College!” some students become quickly bogged down with the difficulties of an unstructured workload, free time in odd segments and the seeming difficulty of finding good friends like the ones you spent years developing at home. College can be a lonely time, especially that first year, when everyone around you seems to be having the time of their lives. If that description of college sounds a bit grim to you, do not despair. Many students travel through the swamp of loneliness freshman year and reach the balmy shores of happiness after a rocky period of readjustment. However, if you know, deep down, that your current school is not for you, do not despair. We hear from students like you on a weekly basis who wish they loved their college, but the image they had does not match the reality they are living. Many feel as if they didn’t get into the college of their choice initially and have admitted that their attitude has held them back from embracing their new life. If you have journeyed to the center of your being, and in the Erised mirror of your heart you encountered your true self, and that self was wearing a different college sweatshirt than the one you currently attend, then it is time to leave. According to a recent report from the Association for College Admission Counseling, one out of three students who enroll in a two-year or four-year college end up transferring at one point or another. You are clearly not alone. Here’s the thing . . . one in three students is an enormous statistic, but despite such a large number of transfer students, there are virtually no structures built into the college system that help facilitate these shifts. We hear from students who feel lost as they begin the transfer process, much more so than when they applied to college. There are plenty of resources when you are an eager high school junior beginning to visit schools, taking APs and Subject Tests and of course negotiating the ACT or SAT. But what do you do now that you are beginning the process again? 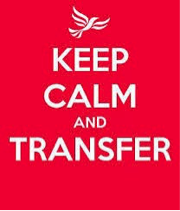 During the transfer application process, you may feel like you are the only person you know who is transferring. You will not have the enforced deadlines from your high school counselor, your parents may only be tangentially involved (or just unsympathetic to your plight), and it is likely that you will have a hard time complaining to your friends, since they are not going through the process with you. It is possible that you want to keep this transfer application a secret from your friends and even your parents. No matter the reasons, the transfer process is a worthy undertaking—one that will change your life and take you one step closer to achieving your goals. If, that is, you have the power of knowledge. If you manage this process in an organized way and follow our advice, you will be on your way to a fulfilling college experience. In our many years working with students, we’ve set out to make a nontransparent process, college admissions, more clear. Transfer admissions is even more confusing, on the surface, than applying as a freshman. That confusion and the many myths about the transfer process cause students and their parents enormous stress. We are here to help you take a breath, gain important knowledge, and create a plan! Looking for expert transfer application essay guidance?